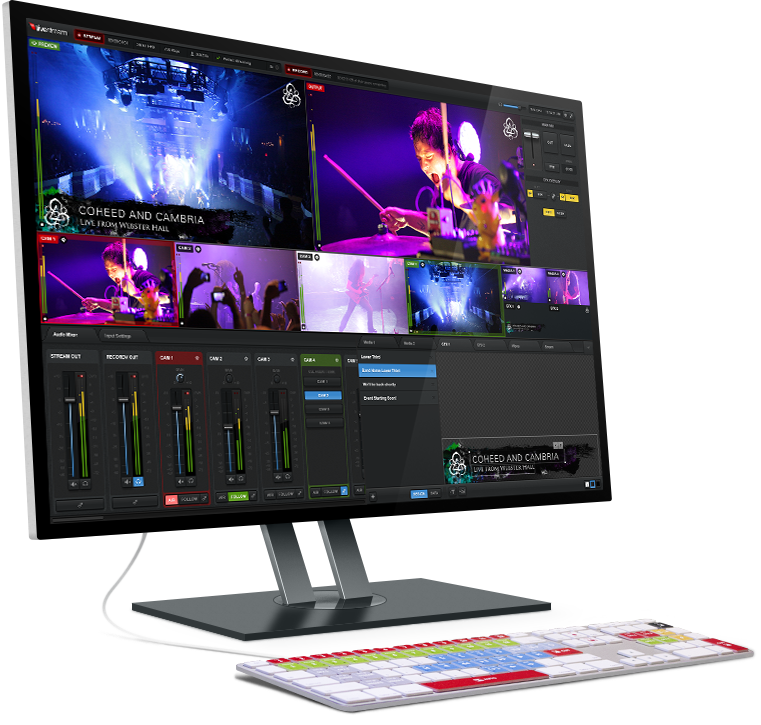 All-in-one live production switcher available as software or integrated hardware from the makers of the world’s leading live streaming platform. Seeing all your cameras in real-time is the key to making the best editorial decisions. 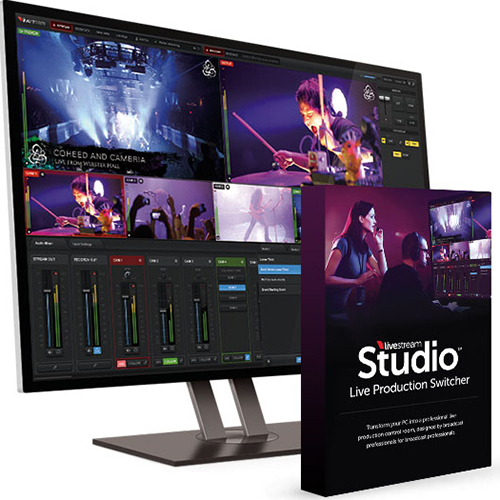 Livestream Studio™ has a built-in multiview with all the features you’d expect from a live production control room, including full field-rate display (no matter how many inputs), tally, input labels and audio levels. Extend the multiview on additional screens to let the full team engage and participate in your production. Easily build a state of the art, master control room with up to four large multiview screens, complete with customizable layouts and logos. Studio’s all-encompassing audio tools cater to producers of all sizes from a one man band to a full production team. Our intelligent audio mixer features mix automation, SDI & HDMI embedded audio, level monitoring, peak warnings as well as our innovative channel grouping. External audio mixers are welcome too! Our fully featured two channel graphics generator allows you to create templates and dynamically change sport scores, lower third text or other graphic elements on the fly. The editor is built right into the user interface and supports text, transparent images, live picture-in-picture video, countdowns and a range of graphic effects including drop shadows, borders, crops and more. Overlay graphics as layers on top of your mix with transparency. Ideal for corner bugs, sport scoring, lower thirds, picture-in-pisture and other broadcast graphics needs. Composite up to 5 live audio/video sources together within the graphics editor; Ideal for a simple second camera angle, a scoreboard cam or a broadcast network 4-person live chat over animated background video. Record your program output in broadcast quality MJPEG to an AVI file for archive and editing later in Adobe Premiere, Final Cut Pro or for playback directly within one of the Studio media players. Now upgraded to allow up to 4 simultaneous recordings - choose from “clean” (without graphics) and “dirty” (with graphics) programs as well any live camera inputs. You can also now open the files being recorded in the media player to trim and replay segments from your live show without stopping the recording. Adding recorded material to your program is quick and easy with the two media players built into the Livestream Studio. Import all popular media formats, including H.264 as well as MP3 & WAV audio. Build playlists, loop clips, and auto-play on transition. Trim clips down for broadcast, and quickly scrub to find exactly what you’re looking for. If a clip does not match your project settings, the built in transcoder will convert the file to match. Now with ISO recording you can get basic instant replay functionality by loading one of your ISO’s into the media player! Desktop - Broadcast a remote computer desktop video and audio as a Livestream Studio input via your local Wifi or Ethernet network. Supports full motion and audio. Requires installing Livestream Studio Remote Camera on the transmitting computer. Unlike most broadcast quality production switchers, Livestream Studio™ comes with a built-in H.264/AAC multi-bitrate live streaming encoder. You can stream HD video directly to Livestream, UStream, YouTube Live or any RTMP compatible server or CDN (Wowza Media Server, Akamai, Flash Media Server). Now supports ZiXi streaming protocol and 1080p streaming when using custom quality settings. Livestream supports simultaneous output to desktop browsers, Roku® connected TVs, iOS™ and Android™ devices. Invisible to the end user, this is achieved through a combination of Flash®, adaptive bitrate HLS and RTSP streaming protocols. Output your live program via SDI or HDMI to large format in-venue screens (iMag), broadcast networks or complement your workflow using external video hardware such as graphics generators, encoders and recorders. Input different video formats into the same project with ease and without the need of external converters, saving you time and money. Keep your talent and camera operators in the know on what source is live and what source is coming next via our tally light integration. Currently supports tally devices from MetaSETZ. Using a Livestream Platform Enterprise* account, add your Google DFP ID and start monetizing your stream with mid-roll advertising. Simply press the “Insert Advertisement” button.